Kanyon welcomes the shoppers on four floors with 160 stores and hosts the top brands of both Turkey and the world. Kanyon welcomes the shoppers on four floors with 160 stores and hosts the top brands of both Turkey and the world. Its proximity to the business and commercial center of İstanbul makes Kanyon the favorite destination both for shopping and eating out. There are 9 movie theatres in the mall as well as gourmet restaurants and cafés. The music and fashion shows in Kanyon shouldn’t be missed. Located in Sarıyer, İstinye Park offers the opportunity to visit all world famous brands under a single roof. Its glass dome and open green spaces gives a refreshing feeling even you are indoors. There are 147 clothing stores and 41 new brands that have entered the Turkish market with their branches in İstinye Park. There are many restaurants serving the best food from various cuisines and a movie theatre with 12 separate halls. İstinye Park won many national and international awards and it hosts a sports & health area. Akmerkez has been attracting the shoppers in İstanbul since 1993, in one of the most vibrant districts of İstanbul, on a 180.000 square meter area. Akmerkez is visited by both the shoppers in its proximity and other shopping enthusiasts from all over İstanbul. Akmerkez has won “The Best Shopping Mall of the World Award” by the International Council of Shopping Centers. There are many stores on clothing, furniture, electronics, design and a lot more. Famous cafés and restaurants can be found in the food court and the famous Italian chain restaurant Paper Moon also has a branch in Akmerkez. 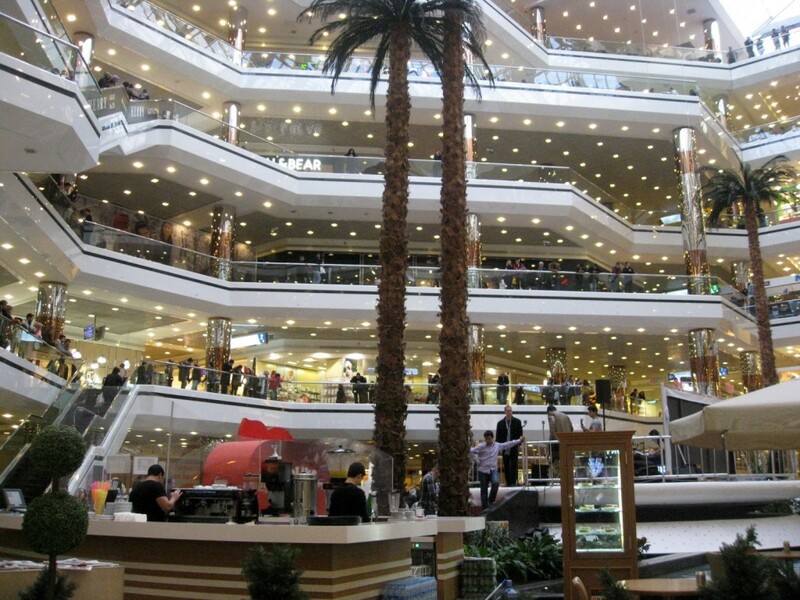 Located in Bayrampaşa, Forum İstanbul is the largest shopping and living center in Europe. It is also home to the first giant aquarium of Turkey, Istanbul SEA LIFE Aquarium and the first theme park of Turkey, Jurassic Land. Forum İstanbul is especially preferred by families with children and it hosts10 different themes such as 10 movie halls, Funlab , Atlantis Bowling, Tiox Entertainment World, Magic Hands Children’s Club, an ice rink and Gmax reverse bungee jumping. The architecture is also spectacular and carries symbolic elements from various aspects of İstanbul such as its impressive dome, large avenues and halls. Full of visitors at any moment during the day, Cevahir welcomes its visitors in the heart of the city on six floors and with more than 200 stores. Cevahir hosts many solid national and international brands and it is especially preferred by families with children mostly because of the movie theatre and indoors theme park & game center Atlantis. Besides fast food chains, you can also eat traditional food in many restaurants or see a play by the İstanbul State Theater.